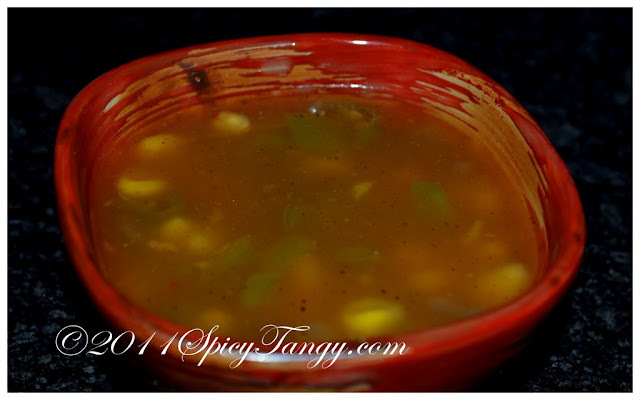 This spicy hot soup will be sure to pump you up after a long day or on a cold afternoon. Enjoy! Take a wok or a deep pan. Add the oil and wait till it is hot. Add the ginger garlic paste, capsicum and corn. Mix well. Add red chili sauce and soya sauce. Mix well and saute for 5 minutes on high flame. Add about one and a half cup water, pepper powder and salt. Squeeze the lemon into the mix. Take a small bowl and mix together the corn flour with some cold water. Mix well and add it to the soup. This way you can avoid lumps in the soup. Cook on medium flame for about 10 minutes. Adjust the seasoning and serve hot!